Late Summer Twilight in the Northern Isles Plays Host to a Full Panoply of Celestial Events. 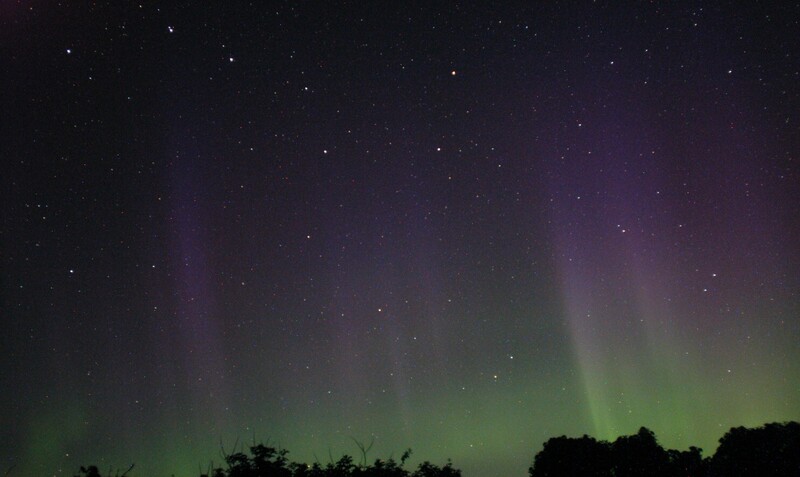 An intense northern auroral glow fused with twilight through the late night and early morning (August 15/16) giving rise to an impressive display of rays and bands. This as backdrop to some brilliant meteors (including a fireball close in brilliance to a full moon), late members of the Perseid meteor shower that peeked in the early hours of 13th August. 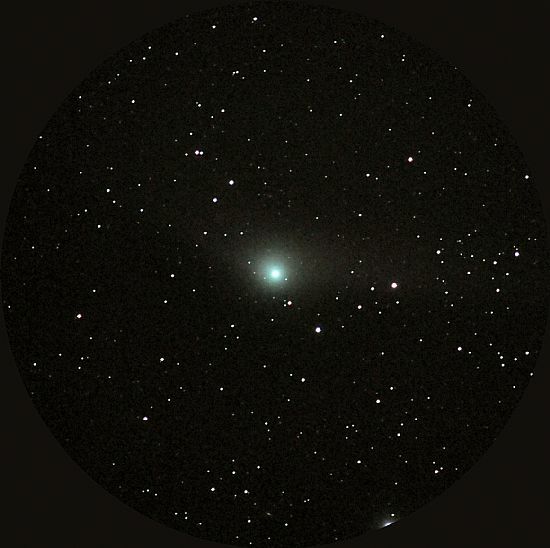 Exceptional atmospheric transparency meant that despite twilight and auroral activity the Milky Way could be seen spanning the sky from NE to SW.
All this hampered, to some extent, work on Comet Lovejoy and scheduled observations of galaxies in constellation Draco—but you can't have it all ways! 2015 August 15: Looking a little west of north at 23h 18m UT. The stars of The Plough are well seen. 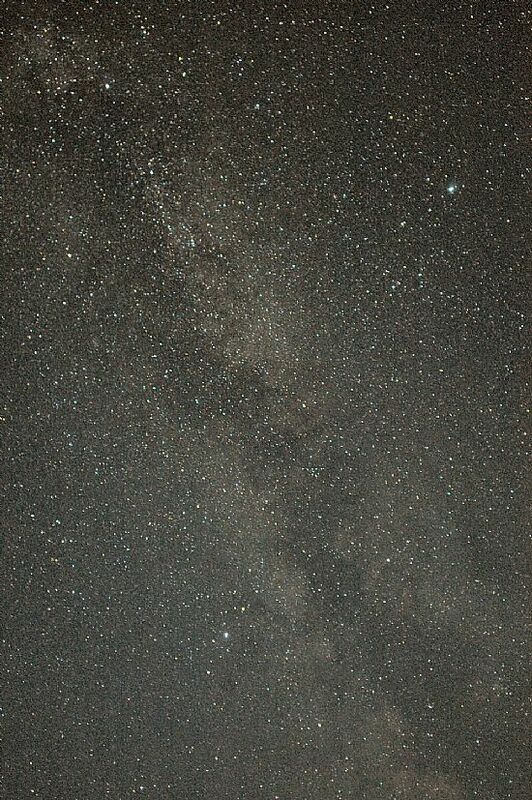 2015 August 16 00h 09m UT: The Milky Way imaged Nikkor 18mm f/3.5 and D100 SLR. A 102 sec. exposure, ISO 600. 2015 August 15 22h 46, UT: Comet C2014 Q2 Lovejoy imaged Nikkor 600m f/4, D800 SLR. A 37.8 sec. exposure ISO 2500. 2015 August 15 23h 13, UT: Galaxy NGC 5907. Nikkor 600mm f/4 with 2x converter. A 37.8 sec. 115 sec. exposure D 800 SLR, ISO 2500. 2015 February 20, 18h 15m UT. Nikkor 135mm f/2.8, D100 SLR 1/13 sec. ISO 800. 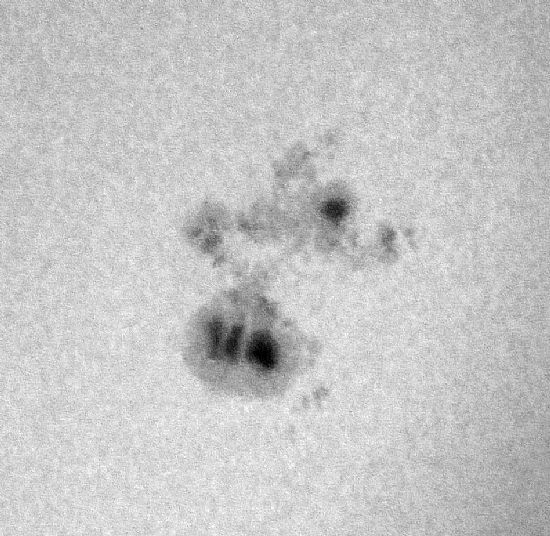 Large sunspot group, No. AR 2192. 2014 September 28. 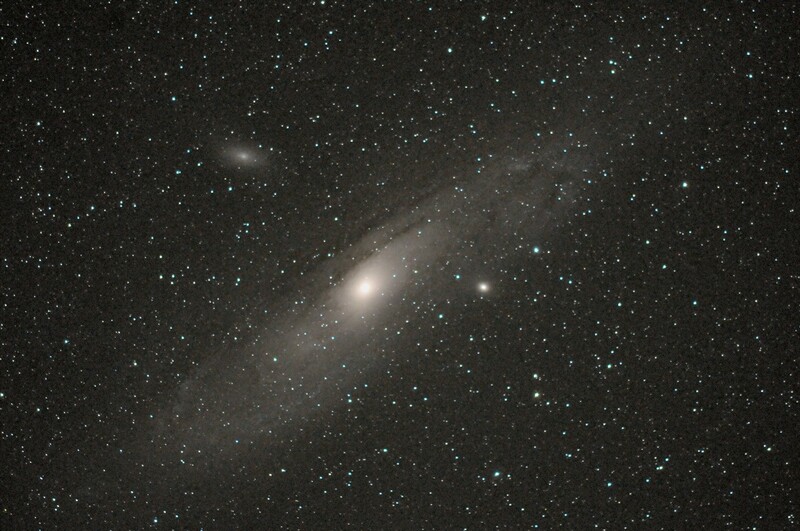 The Andromeda Galaxy M31 IS still there! from down here, must be still there.! 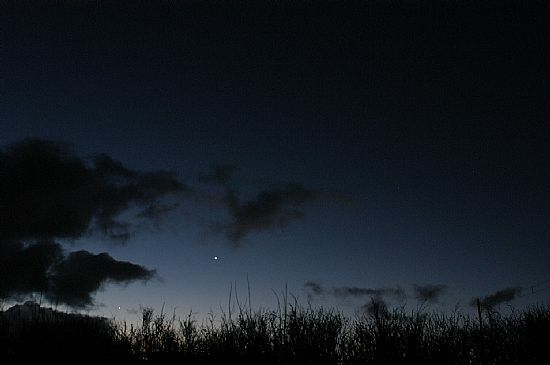 The Early Morning Sky looking South 2014 March 26. 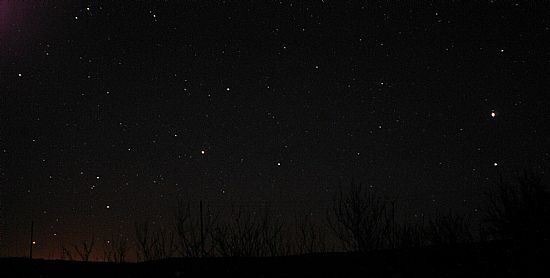 From left to right (east to west) the brightest objects are: low down close to the “Hydro” pole, the super-giant, red star Antares (in Scorpius), planet Saturn (in Libra), planet Mars immediately above the white star Spica (in Virgo). 2014 February 26. Naked-eye Spectacular. 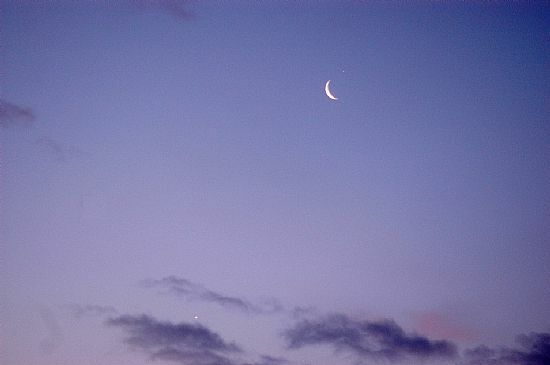 A number of folk reported having seen Venus and the waning Moon in the early morning sky shortly before sunrise. 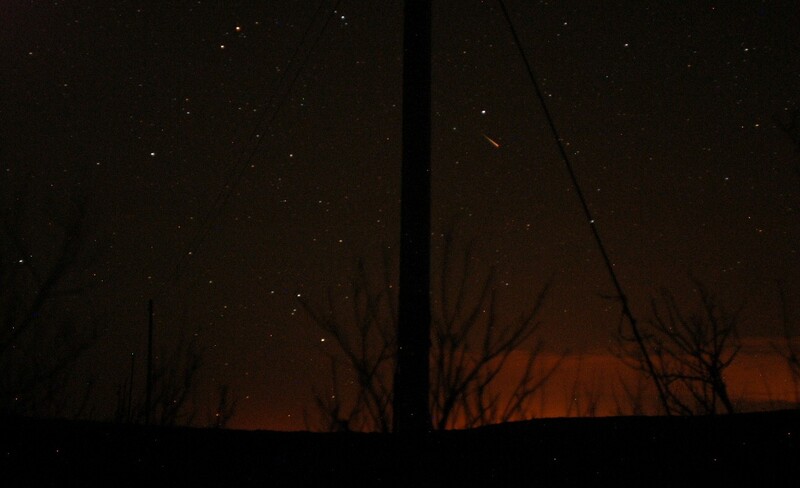 Imaged from Springfield looking SE at 06h 44m UT. Nikkor 210mm zoom D100 SLR. 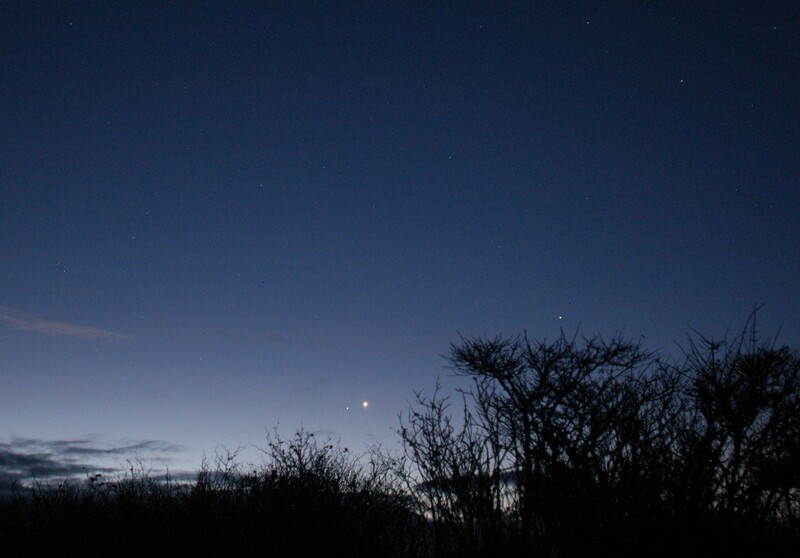 2013 November 23: Mercury at Dawn. almost painful in his isolation. I feel a welcome intruder. 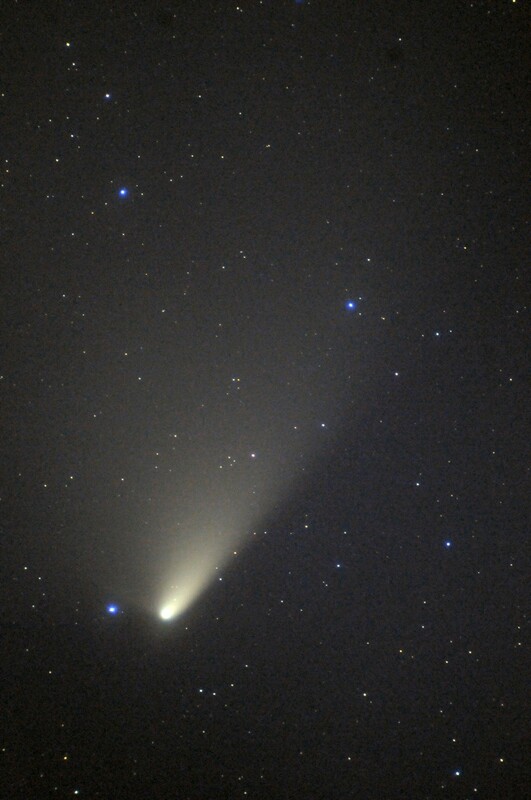 We have been requested to show what we consider to be the finest image we have secured to date of Comet PanSTARRS. The Great Galaxy in Andromeda (M31) Comet C/2011 L4 (PanSTARRS) and a meteor captured in the frame 2013 April 03, 22h 07m UT. Nikkor 200mm f/2. An 8 sec exposure, D300 ISO 1600. 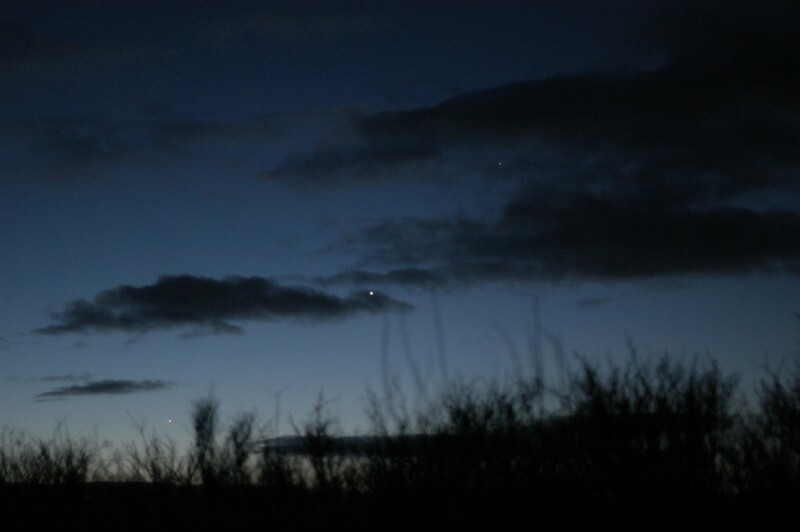 The early morning sky 2012 December 02, looking south-east from Rousay (Springfield) at 07h 16m UT. 2012 December 02. 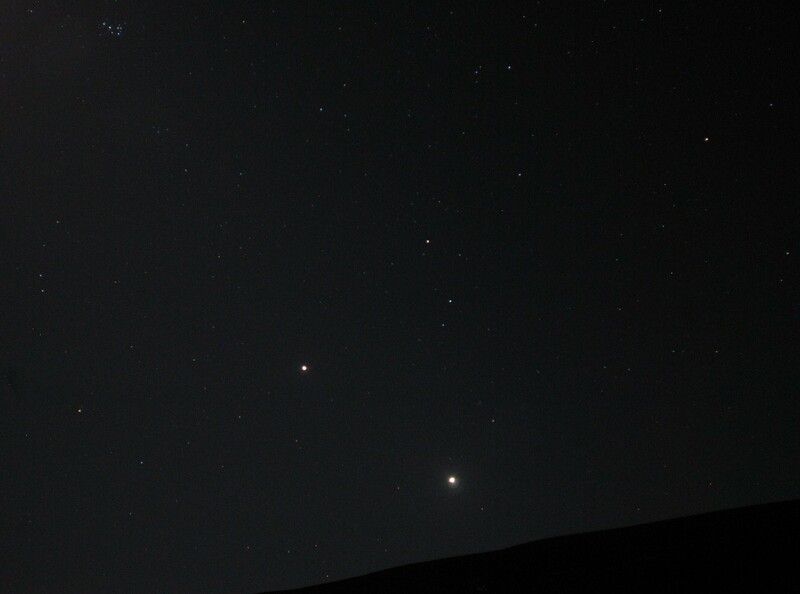 From left to right: Mercury (mag-0.3), Venus in cloud (mag. 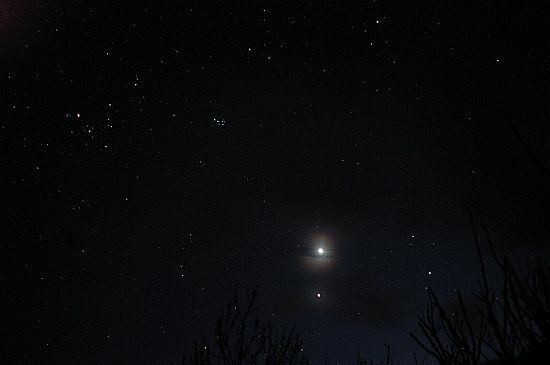 –4.0) & Saturn (mag 0.6) also in cloud, in the morning sky 07h 16m UT: Nikkor 50mm f/1.8, D100 SLR ISO 500, exp. 1/5 sec. 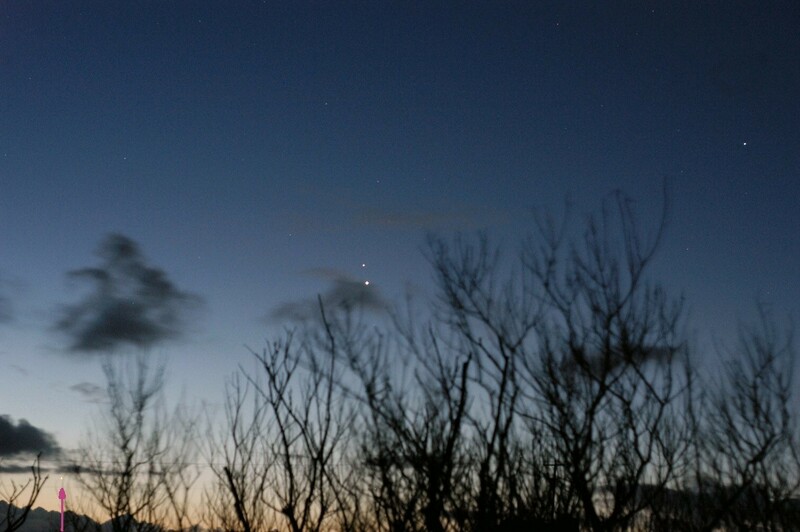 how the planet Mercury shone gold-like at dawn. buoying through the cloud-driven sky. The early morning sky 2012 December 01, looking south-east from Rousay (Springfield) at 07h 20m UT. 2012 December 01, From left (low) to right: Mercury (mag-0.3), Venus (mag. 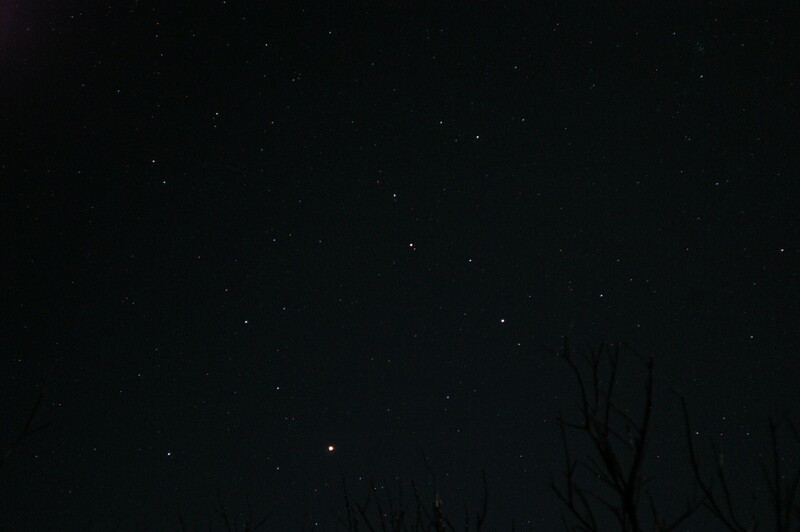 –4.0) & Saturn (mag 0.6) in the morning sky 07h 20m UT: Nikkor 50mm f/1.8, D100 SLR ISO 500, exp. 1/6 sec. 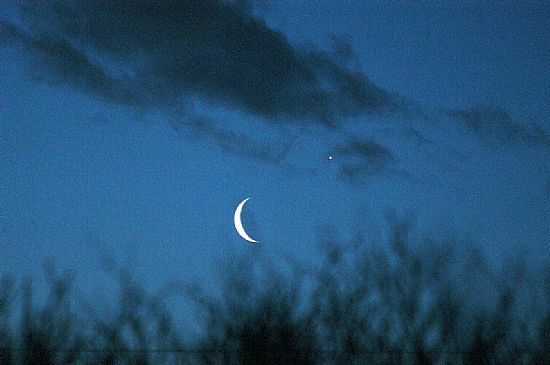 Those who have been following this series will be aware by now how rapidly the two inner planets (“inferior” planets) Mercury and Venus, move in relation to the star background and to each other. 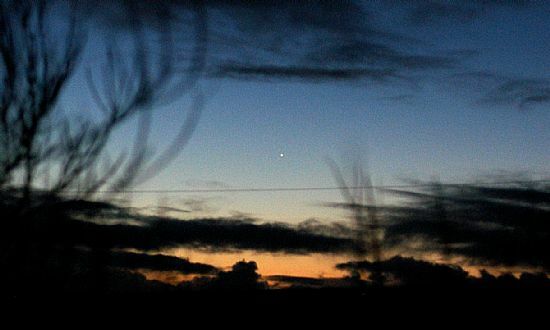 Venus will appear to move in on Mercury until around December 10, after which they will move apart. 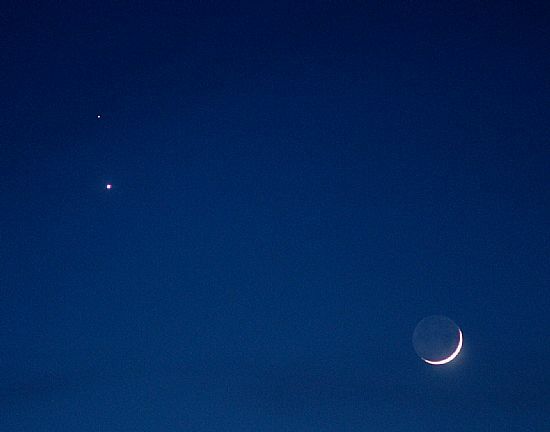 The three mornings of the 10,11,12 December will find the crescent Moon running just below the three planets. Look out for this interesting line up on the SKY VIEW page nearer the time. The other important feature to note is the rapid change in Mercury’s brightness from day to day. This will slow down by December 5, when Mercury’s magnitude will have reached –0.5, at which it will stick for three weeks. It is unlikely that we shall be able to observe the planet without optical aid in the morning sky much beyond the middle of December. For more information see Sky Notes feature on the PLANETS page. 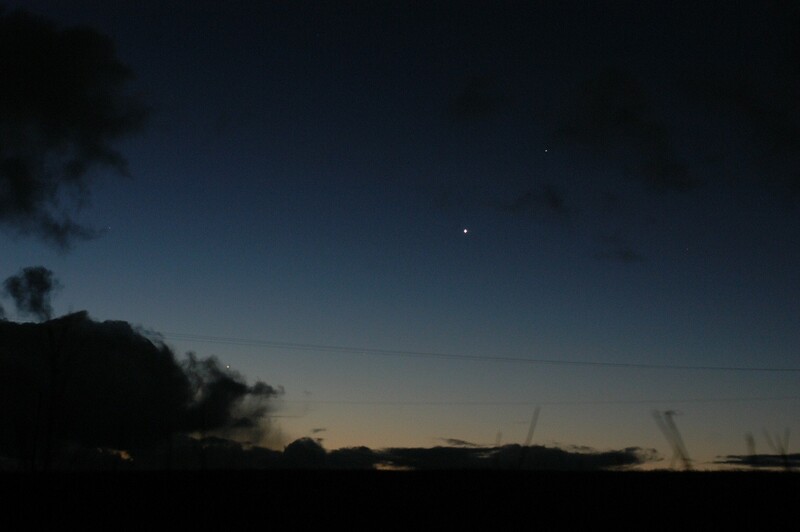 The early morning sky 2012 November 30, looking south-east from Rousay (Springfield) at 07h 24m UT. The early morning sky 2012 November 28, looking south-east from Rousay (Springfield) at 07h 21m UT. The early morning sky 2012 November 27, looking south-east from Rousay (Springfield) at 07h 00m UT. The early morning sky 2012 November 26, looking south-east from Rousay (Springfield) at 07h 04m UT. Venus preparing to rendezvous with Saturn. Imaged 2012 November 26 at 07h 04m UT. From left to right: Saturn (mag. 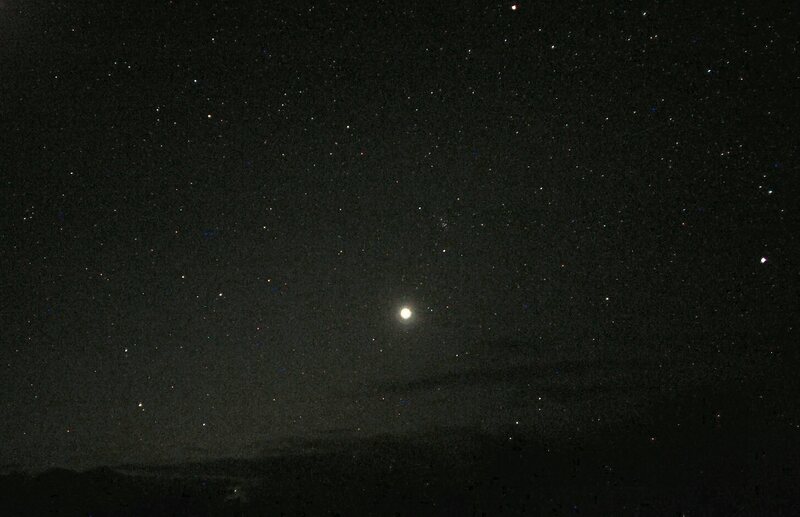 0.6), Venus (mag. 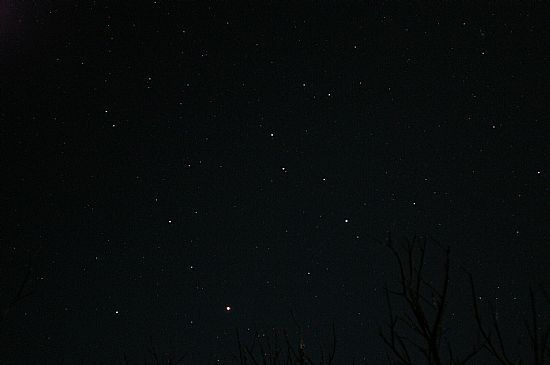 –4.0) and Spica (principle star in the constellation Virgo, mag. 1.0 var.) 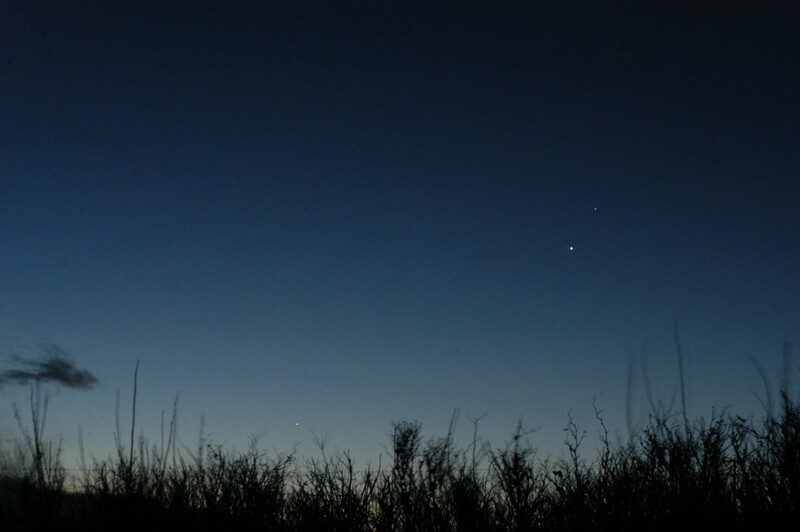 Separations at time of observation: Saturn-Venus 59' 57" Venus-Spica 11° 50'. 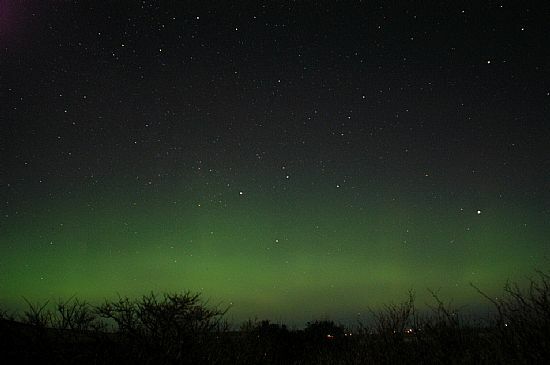 The early morning sky 2012 September 19, looking east from Rousay (Springfield) at 03h 40m UT. Jupiter in Taurus. early morning sky 2012 September 19, looking east at 03h 39m UT. 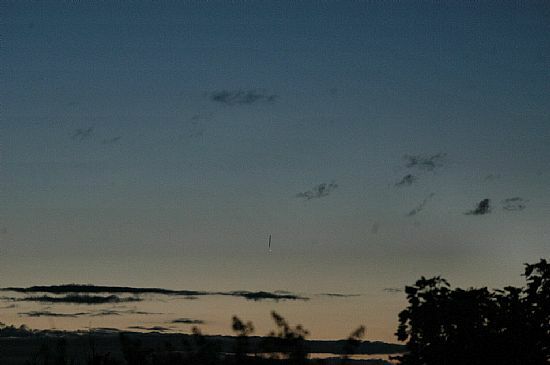 Mercury in the morning sky 2012 August 18. The Milky Way: Late Evening 2012 August 11. 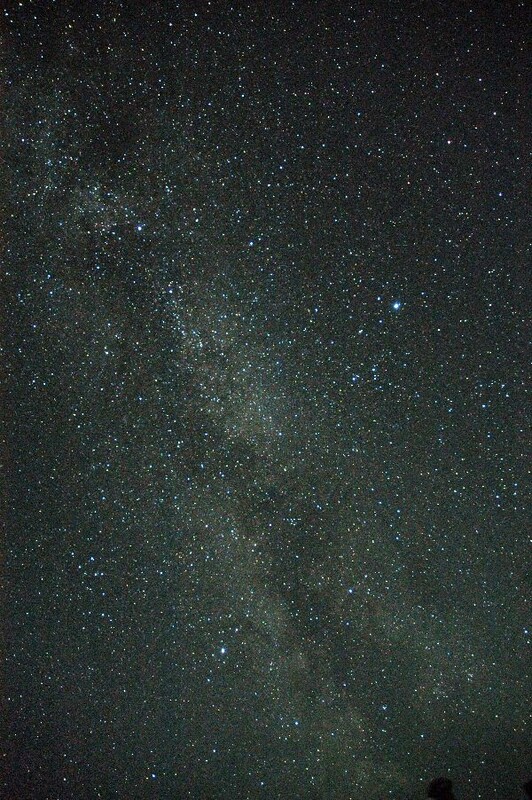 The Milky Way: 2012 August 11, 23h 05m UT. A 55 sec. exposure. Nikkor 24mm f/2.8, ISO 600. D100 SLR. 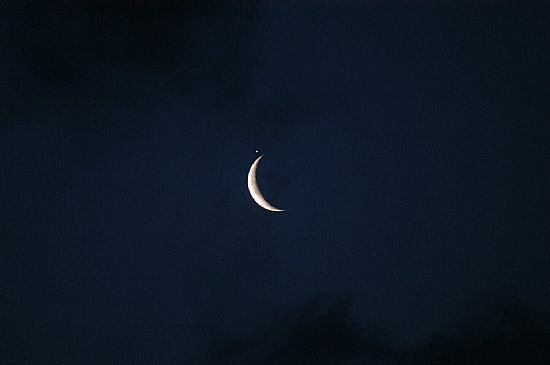 The conjunction between Jupiter and the waning Moon in the early hours of 2012 July 15. 2012 July 15, 02h 09m UT. 100mm achromat. 45x Minolta Dimage F200 1/40 sec. ISO 400. 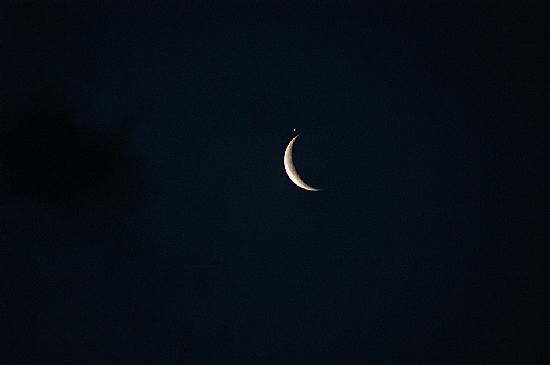 July 15, 2012, 02h 00m: Nikkor 300mm f/4.5 and Nikon D100 SLR 1/20 sec. ISO 500. 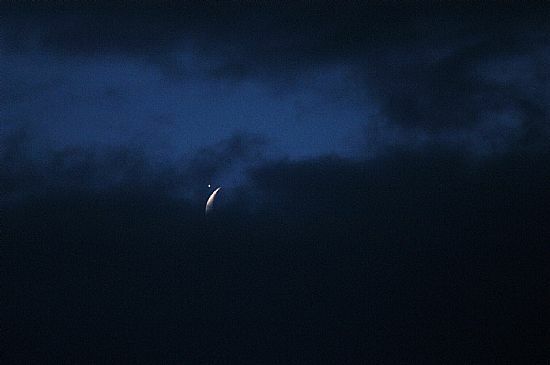 July 15, 2012, 02h 00m UT: Nikkor 300mm f/4.5 and Nikon D100 SLR 1/20 sec. ISO 500. 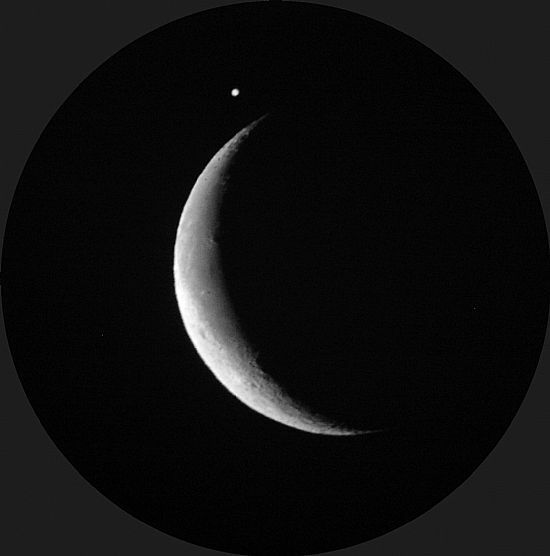 July 15, 2012, 02h 05m UT: Nikkor 300mm f/4.5 and Nikon D100 SLR 1/20 sec. ISO 500. 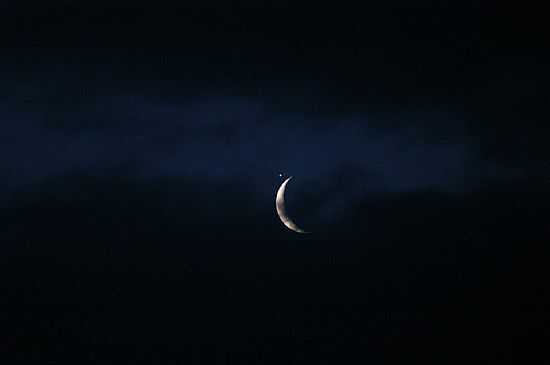 July 15, 2012, 02h 06m UT: Nikkor 300mm f/4.5 and Nikon D100 SLR 1/20 sec. ISO 500. 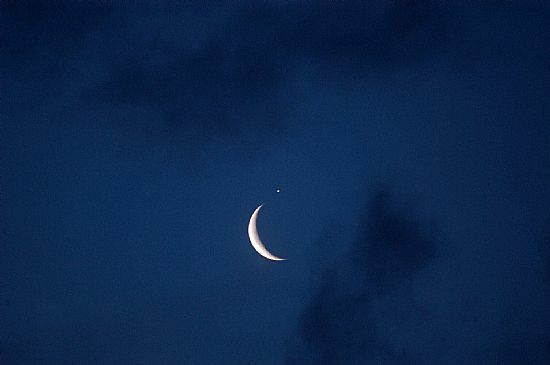 July 15, 2012, 02h 27m UT: Nikkor 300mm f/4.5 and Nikon D100 SLR 1/20 sec. ISO 500. 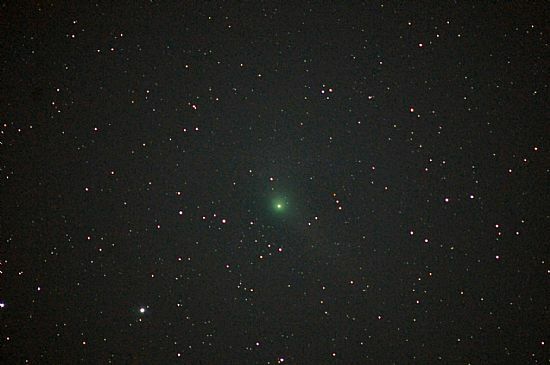 Comet Garradd imaged 2012 January 27, 05h 01m. Much against my better judgment I agreed to appear on a recent programme in the “Call Kaye” series from BBC Radio Scotland. Kaye was quite open in admitting she was not much turned on by cosmological space and wanted to know what use it all might be for the “ordinary” person. At one stage I was asked what had been the most spectacular object I had seen in a telescope. I returned the question to the first point by asking what use anything might be to a species that appeared intent on destroying the planet in its quest for success! I suggested some knowledge as to our place in the greater scheme of things might give a sense of proportion and to not take ourselves too seriously. To the second question I had to admit that as a very young lad my first sighting of Saturn in a small telescope took some beating. 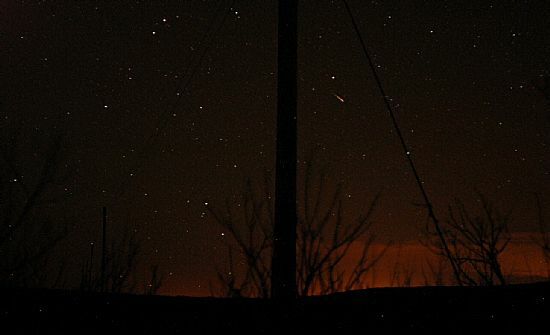 But then some of the most spectacular stuff may be enjoyed without any equipment whatsoever and I mentioned Comet Hyakutake of 1996 with its "head" in the zenith and a tail stretching almost to the horizon, as viewed from Orkney on March 30 that year. 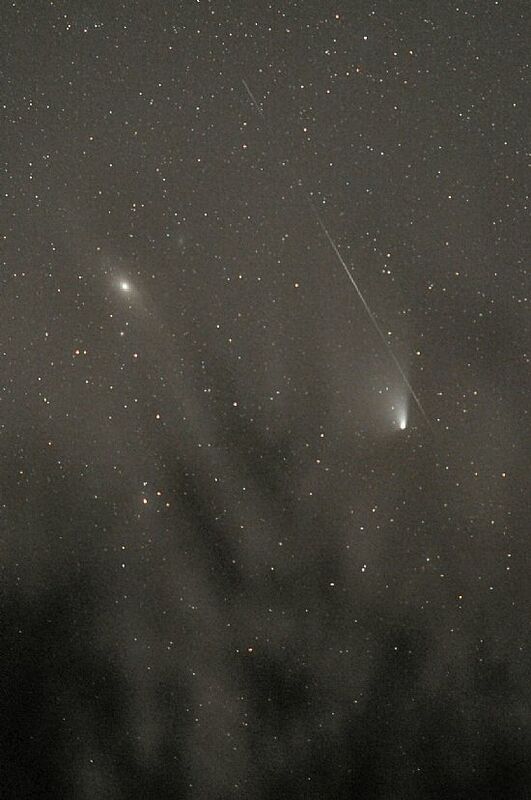 Other naked eye spectaculars would include the Leonid meteor shower in full flow or the experience of an aurora from an open boat on a flat sea when the splendours of sky were reflected in the water giving one the sense of floating in interstellar space. Venus "passing" the Pleiades 2012 April 04. 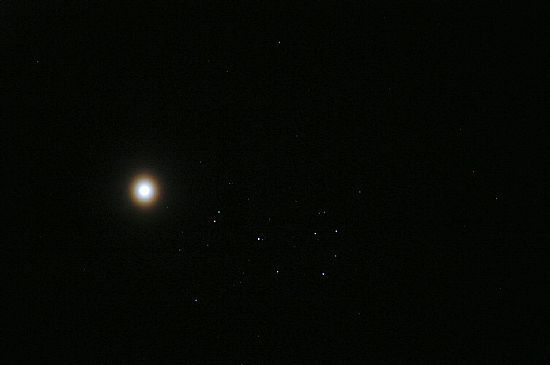 Venus appearing close to the Pleiades open cluster. 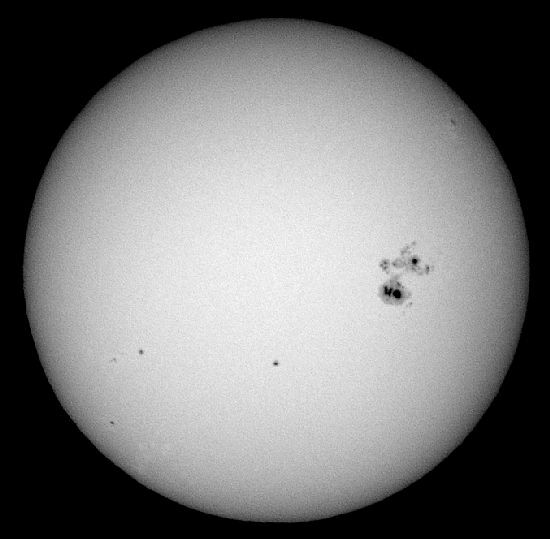 Imaged 2012 April 4 at 20h 26m UT. Nikkor 300mm f/4.5. 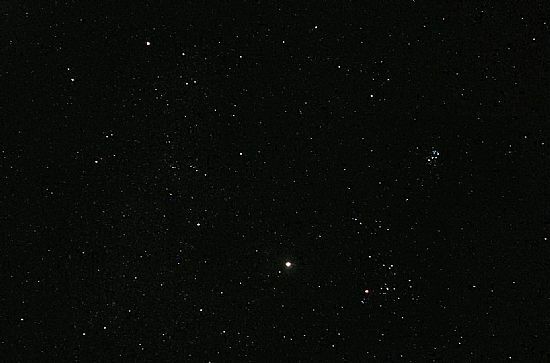 D100 SLR, 1 sec. exposure ISO.400 (static camera) in a hazy sky. Alcyone at visual apparent magnitude of 2.8 (the brightest star in the cluster) is outshone by Venus (mag. –4.4) approximately 800 fold. Jupiter & Venus Conjunction March 2012. The view as seen from Springfield, Rousay. 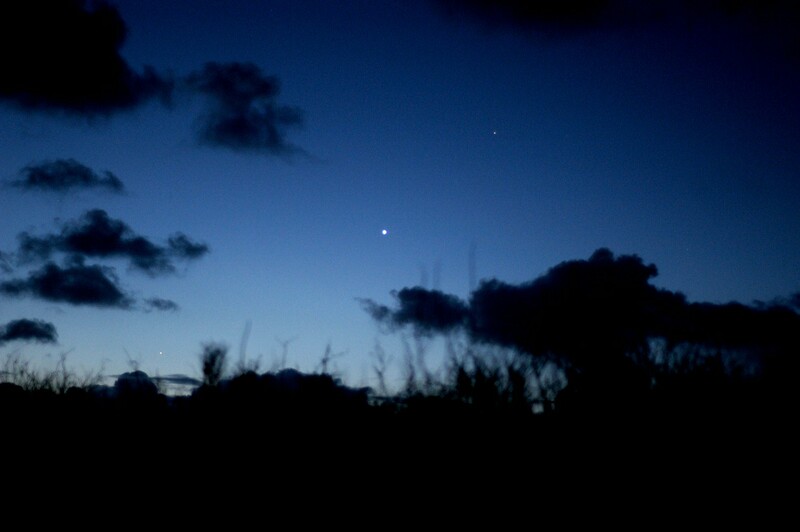 Venus with Jupiter below struggling against transient cloud. The two principle stars of Aries are to be seen to the immediate right. 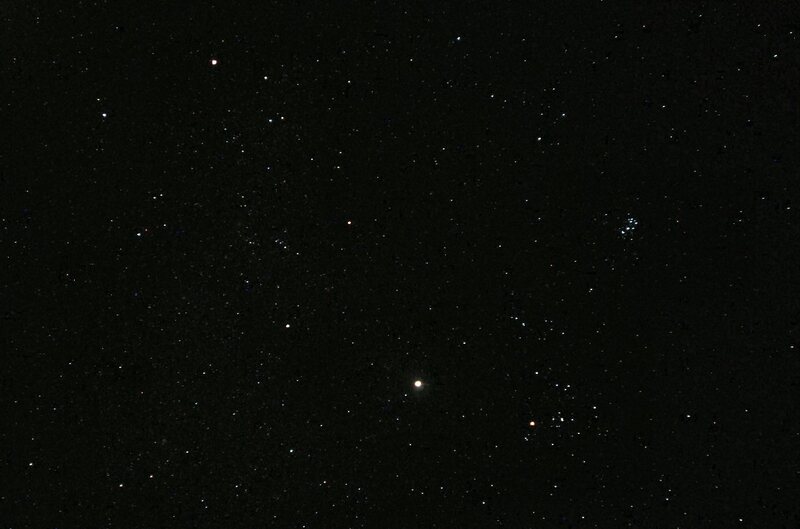 The Pleiades Cluster (looking like a miniature Plough” with part of the handle missing), above left, with further to the left the bright, red super-giant star Aldebaran (eye of the Bull) in the open Hyades Cluster. A 15 sec exposure Nikkor 24mm f/2.8 and D100 SLR ISO 500. Sample of observations (images) made 2012 March 01, 17h 58m UT to March 02, 04h 21m UT. The night was of moderate transparency but variable, sometimes poor, seeing. This limited lunar and planetary observations in terms of high magnification (at times even with the 132mm f/7 triplet the equatorial bands on Jupiter were scarcely visible and Mars with the same instrument showed no markings—not so much as a single polar cap! 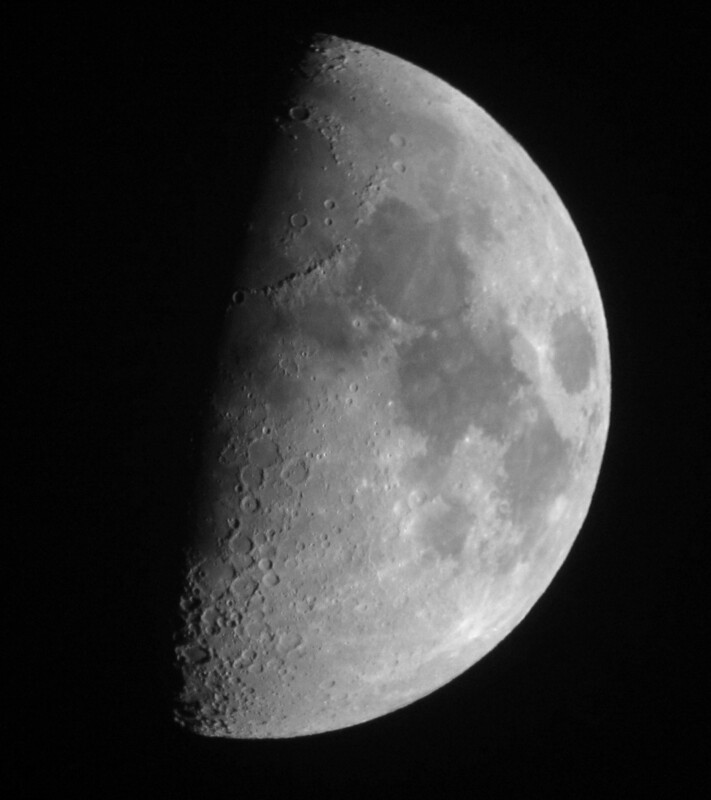 Moon at 18h 09m UT. 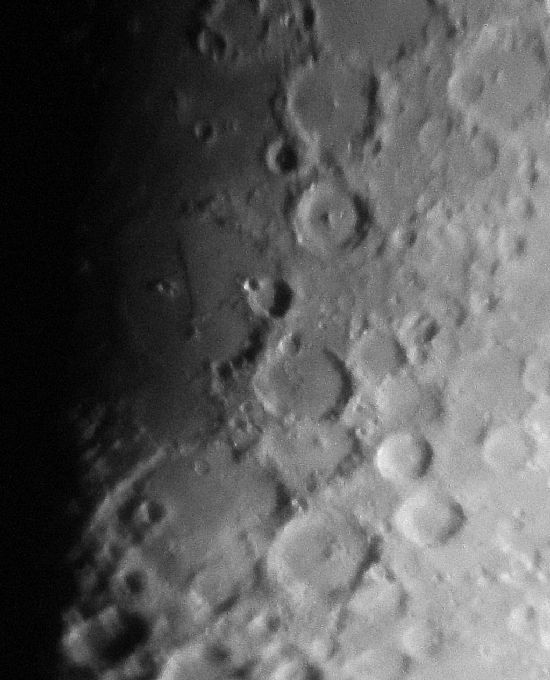 132mm f/7 apochromatic triplet Canon IXUS 310 HS DC showing the Straight Wall (Rupes Recta) on the terminator. 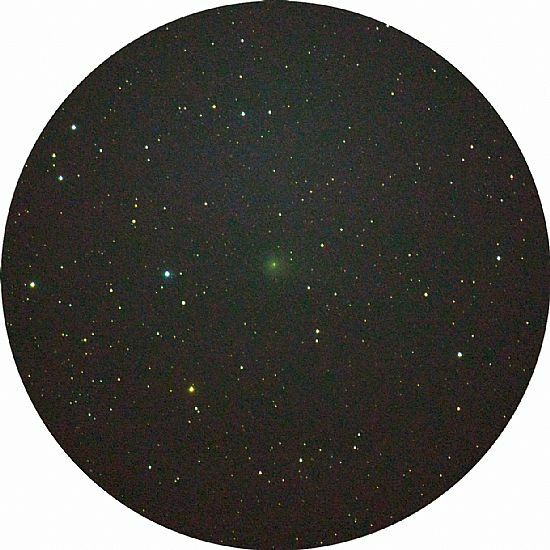 Comet Garradd at 20h 30m UT. Nikkor 600mm f/4. D300 SLR ISO 1600. Exposure limited to 30 sec. due to sky illumination from auroral glow and moonlight. 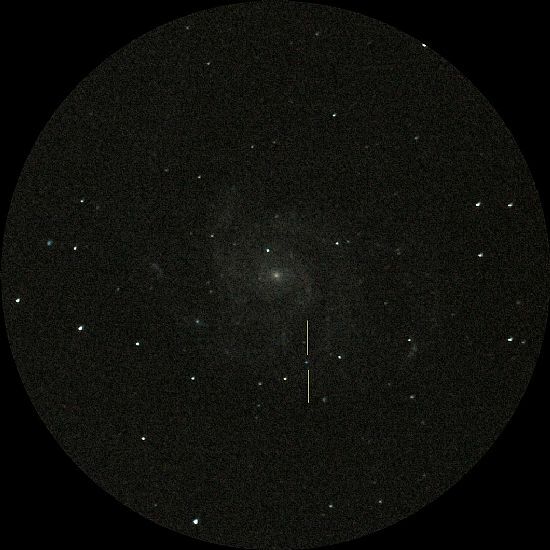 M101 showing the much reduced super nova indicated between the two yellow lines imaged at 21h 26m UT. The “bright” star appearing close to the centre of the galaxy (not part of the galaxy as is the nova) is GSC 3852-1012 mag. 12.67. 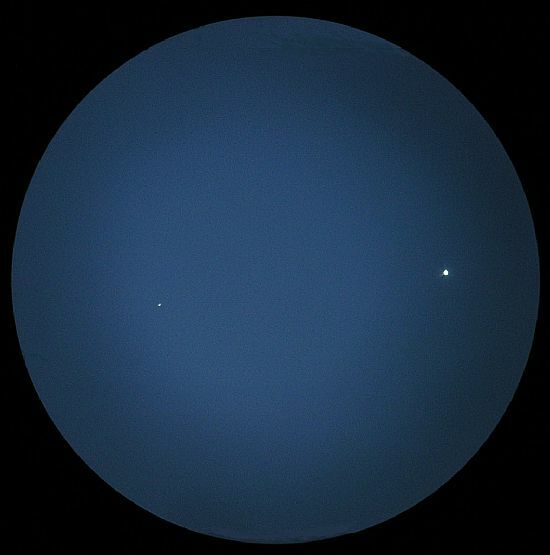 The star immediately below the nova is GSC 3852-817 mag. 15.25. 200mm f/8 Ritchey Chretien. A 50 sec. exposure D300 SLR ISO 1600. 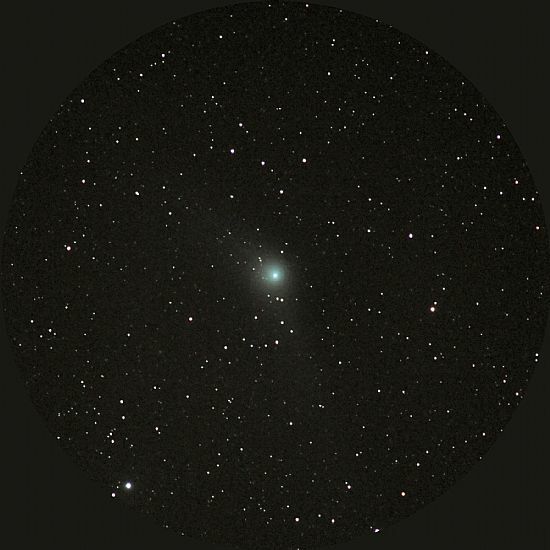 Comet Garradd imaged in the early morning of March 02 at 03h 59m UT (moonset 03h 53mUT). Nikkor 600mm f/4. D300 SLR ISO 1600. Exposure limited to 70 sec. due to sky illumination from auroral glow.